Editor’s Note – This commentary reflects the opinions of the author and is republished with permission of the author with first publication on his site, TeleRead. Donald Trump is famous for his contempt for the written word. He hates to read briefing papers. 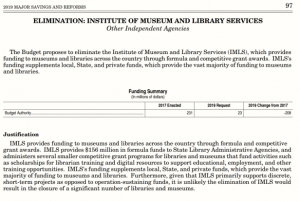 So, to the presumed delight of ideologues like House Speaker Paul Ryan, Trump is once again trying to kill off the Institute of Museum and Library Services and some related programs. Got to help pay for all the billions in tax cuts for multi-billionaires like the Koch brothers, right? Oh, great. Who cares whether libraries lack sufficient money for professional development and ebooks—as long as just a few libraries close? Don’t you love the Trump Administration’s passion for learning and a well-developed workforce? The budget document claims to take “important steps to expand opportunities for Americans to access affordable, employment-relevant education that puts them on the path to a well-paying job and, ultimately, a fulfilling career.” By zeroing out IMLS and related activities? As keen as I am on the need for a national library endowment, it would only augment public funding, not replace it. Even IMLS provides just a speck of total funding—most library money comes from local sources. But this is a still crucial speck, especially in cash-strapped rural areas. Trump has talked about the need for broadband there. But what are families going to do with it? Just watch cartoons and on-demand Fox News. Good libraries are all about content and community and the needs of local people. You can read a well-done reply from the American Library Association, which I’ll reproduce below. ALA must be statesmanlike. I don’t. We’re led by a loathsome would-be dictator, and the sooner we can impeach Trump—don’t get your hopes up under the spineless Republican Congress—the better off we’ll all be. Here’s the email-your-legislators link in the ALA Action Center. Also see EveryLibrary‘s commentary and its action page with a suggested letter for House and Senate members. Ideally you can mention IMLS grants to libraries in your own city or state. Here are some recent grants I found for Virginia, including one for academic librarians to “develop a roadmap and white paper for library adoption of Three Dimensional (3D) and Virtual Reality (VR) services.” With grants like this in mind, librarians have correctly thought of IMLS as, among other things, a venture capital fund. If the past repeats itself, even the Republic Congress won’t let our nonreader-in-chief kill off IMLS. But at this crazy time, we shouldn’t take anything for granted. So whether through ALA, EveryLibrary or directly, do catch up with Congress members and remind them in more tactful language than mine of the need for the agency and related programs.